I had nice chance to meet with my old & new friends acting as if I were a madam serving in tea salon for 4 days. I asked Mr. & Mrs. Mizuno through twitter, the friend-basis consultant of ANTEPRIMA as far as I myself consider. 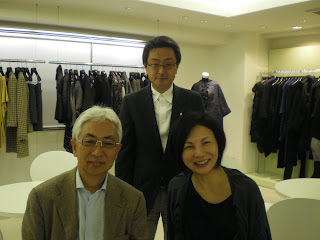 Seri san who came twice and Miwako san are also my ANTEPRIMA friend-basis PR as far as I myself consider. I love them so much. Dear all the department stores, magazine publishers, Thank you for coming. I received warm support so I will try my best for next spring summer collection.